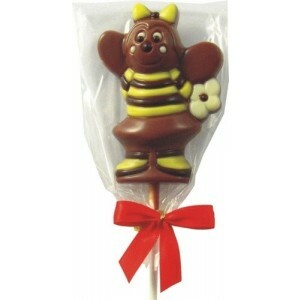 A cute milk chocolate bumble bee on a stick with bumble bee coloured chocolate decoration. These are ideal to give as party favours or as prizes for the winners of your party games. Each chocolate bumble bee lollipop is finished with a personalised label and we will happily personalise these with individual names if you are ordering for each of your guests. Please enter your personalised details into the text box below. 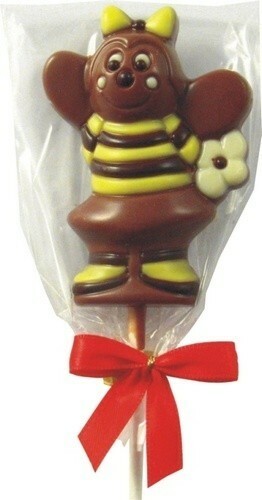 Each chocolate bumble bee measures 8cm x 6cm and the height including the lollipop stick is 15cm. The actual chocolate bumble bee is wrapped in cellophane and finished with a satin bow. Adorable! £1.99 per Chocolate Lollipop. Made in the UK.